Everything you need to know about the safety and efficacy of cosmetics and cosmeceuticals. Is it a cosmetic? A drug? A nutrient? It’s becoming more and more difficult to tell the difference with the cosmetic companies combining the three. And unlike with food additives, the FDA has little control over what goes into the products that claim to make you look more beautiful–even though cosmeceuticals (cosmetics that purport to have druglike benefits) have skyrocketed into a multibillion-dollar industry. 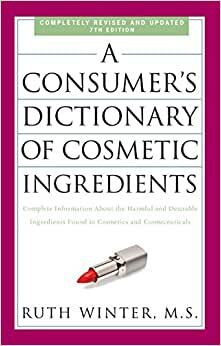 So before you slather on that “wrinkle-reducing” cream or swallow a “skin-rejuvenating”vitamin, find out what’s in your health and beauty products with A Consumer’s Dictionary of Cosmetic Ingredients. This updated and expanded edition gives you the facts you need to protect yourself and your family from possible irritants, confusing chemical names, and the exaggerated claims of gimmicky additives. With 800 new ingredients found in toiletries, cosmetics, and cosmeceuticals–everything ranging from shampoo to shaving cream, bath lotions to Botox–this alphabetically organized guide evaluates them all, and includes targeted information for children and for people of color. A Consumer’s Dictionary of Cosmetic Ingredients is more indispensable than ever to anyone who cares about the health of themselves and their loved ones. RUTH WINTER, M.S., is an award-winning author of thirty-seven books. Visit her at BrainBody.com or IngredientBlog.blogspot.com. Does a wrinkle on your face cause you to panic and make you fear you are becoming unattractive and unemployable? Do you believe a fragrance can make you irresistible? Are you willing to spend your hard-earned money to buy expensive cosmetics that promise you a cure for whatever flaw you think you may have? • Aging and wrinkles are to be greatly feared. • Natural body odors are mortifying. • Cosmetics can cure anything. I really do admire the cleverness of cosmetic producers and sellers— even if they don’t like me because I reveal to you what is really in their products. But I believe they are still fabulous sociologists, psychologists, and marketers. They know before anyone else what we want or should want, and they immediately build upon those desires to sell us what we may or may not need. From the department store counter to the drugstore to the Internet, they have given us literally thousands of choices of cosmetics. As you will read in this dictionary, some of the potions and powders are excellent and fulfill their promises, many of the compounds do nothing and are actually fraudulent, and some may be damaging to our health because they contain toxins or cancer-causing agents. Cosmetics have always been a low priority at the U.S. Food and Drug Administration (FDA), but now its regulatory powers have been weakened to the point where they are almost nonexistent. Why Are Cosmetic Regulations So Limited? The agency’s regulations were determined more than seventy years ago when it was wrongly assumed that the skin is an impermeable barrier that prevents chemicals from penetrating into the body. Scientists now know that this is not true, yet most consumers and cosmetic companies are concerned only with allergic reactions and skin irritations. But what of systemic absorption, toxicity, and chronic effects? What degree of absorption is there when a cosmetic is left on the face (as a makeup base might be for twelve hours) or spread over the entire body (like suntan lotions)? What is the impact when these products are used for many years? All we know is that cosmetics can affect us outwardly and inwardly, so the question becomes, What safeguards does the FDA have today? Why Is the FDA So Powerless? • The FDA cannot fulfill its mission because its scientific base has eroded and its scientific organizational structure is weak. • The FDA cannot fulfill its mission because its scientific workforce does not have sufficient capacity and capability. • The FDA cannot fulfill its mission because its information technology (IT) infrastructure is inadequate. Why is the FDA so beleaguered and underfunded? No matter how skilled and well intentioned the staff may be, they are being smashed under an impossible workload. Unless consumers like you and savvy organizations such as those listed on pages 559–564 lobby effectively for changes, nothing will happen. Although the FD&C Act does not require cosmetic firms to register manufacturing establishments or formulations with the FDA or make available safety data or other information before a product is marketed in the United States, manufacturers or distributors of cosmetics may submit this information to the agency voluntarily. Voluntary registration and assignment of a registration number by the agency does not denote approval of a firm or product by the FDA. Any use of a registration number in labeling must be accompanied by a conspicuous disclaimer phrase as prescribed by regulation. Cosmetic companies that wish to participate in the voluntary registration forward data to the FDA. Only an estimated 35 to 40 percent of the companies are honorable enough to inform the FDA of the ingredients they are using. But since the last edition of A Consumer’s Dictionary of Cosmetic Ingredients, there is a new game being played. A significant number of the companies are “registering” their names with the FDA and then saying in their ads “Registered with the FDA” in an attempt to have us believe their product has been approved by the agency. Although there are no full-time field agents assigned to cosmetics, investigators in district offices may be assigned “as the need arises.” The FDA is supposed to collect cosmetic product samples as part of its rate plant and import inspections. If the FDA does wish to remove a cosmetic from the market, it must first prove in a court of law that the product is injurious to users, improperly labeled, or otherwise violates the law. Such court cases in the past have cost the budget-strapped agency millions and the companies with their powerful lawyers and political clout almost always win. Is there anyone at the FDA who deals with a consumer’s physical problems caused by cosmetics or ingredients not explicitly prohibited by the FDA? • 781 ingredients were found safe as used. • 408 ingredients were determined safe with qualifications. • 119 ingredients could not be evaluated because of insufficient data. • 9 ingredients were cited unsafe. In 2007, the trade organization the Cosmetic Toiletries and Fragrance Association’s (CTFA) board of directors changed its name, as mentioned, to the Personal Care Products Council (PCPC) because “the change represented a new, broader and more contemporary name to better represent the association’s growing and diverse membership.” In addition, the board chose a new motto for the association: Committed to safety, quality and innovation. The PCPC states that its members produce the majority of the cosmetics on the market. We should be grateful that there are scientists testing ingredients for us. The cosmetic companies, however, are politically astute. Such self-testing and efforts at self-regulation fend off potential outside regulation by government agencies. And the cosmetic manufacturers contribute heavily to political campaigns, including the presidential race. It is in their own interest, of course, to avoid using an ingredient that might be found at some later date to be potentially harmful. Adverse publicity can instantly kill a product into which millions of dollars have been invested. Due largely to consumer pressure, some states have been formulating stricter regulations concerning cosmetics. If you just read 1 lable, say favorite or kids shampoo bottle ingredients you'll flip.Manufactures use and combine 40letter word's to hide what the ingredients really are saying. In your bottle you will see SULFATES.....3-5 kinds even in gentle,no tear,hydration,ALL of em.SULFATES WERE ORIGINALLY ONLY FOR "STRIPPING GREASE &GUNK FROM TRUCK ENGINES "Its in your TOOTHPASTES.Any CONDITIONER can only work/absorb in your hair for 5min. Thats barely enough to try n fix what ur shampoo just did. True. Thise 30 min or all nighters do more, though most are led to believe different. Edta, in everything, its the main ing in EMBALMING FLUID (for the dead). Adding more soon. More bubbles &foamy suds is not better fo u than SULFATE FREE unless ur a greasy, gunky, grungy engine that you are washing. Read n see. Ull flip n like me get a little upset that OUR FDA, USA APPROVES MILLIONS OF INGREDIENTS IN FOOD N BEAUTY N MORE WHERE OTHER COUNTRIES HAVE BANNED THEM FOR YEARS! You will find yourself looking up just about everything in this book, and you will be surprised at some of the incredibly useful information you find. If you want to know what's in your shampoo/soap/lotion/toothpaste/vitamins/etc... whether it's good or bad for you, and what it was derived from, this is your book. You will probably find yourself wanting to buy a copy for everyone you know with allergies or sensitive skin. I started with the 3rd edition and I must note that the revised version is loaded with additional information. If you own one of the earlier versions it's worth the upgrade. 5.0 颗星，最多 5 颗星LOVE DICTIONARY OF COSMETIC INGREDIENTS. YOU GOTTA HAVE IT!!!! Everything You Need To Know, About What Your Putting On Your Face and Skin. Is Right Here, In This Book!!! You Gotta Have It! Plus, Super Shipping With Amazon. 2 Days. Very basic. Paula's choice offers an equivalent online and it's free and Actually a bit better because it gives a ranking on the ingredients. This one just stated what they are, not whether or not you want it on your skin. Was hoping for something more in depth.